Not the Black Market Band, but a similar scene: 9th Infantry Division Artillery band playing in Les Pieux, France, on July 4th, 1944. 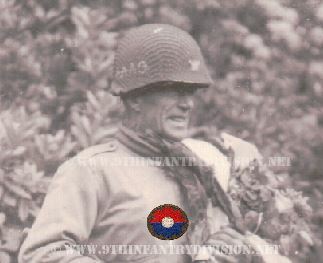 Picture by Frank Lovell, 60th Field Artillery Battalion, 9th Division. During World War 2, the 39th Infantry Regiment had its own music band. It was known as the “Black Market Band” because its members bought, found, stole or borrowed instruments to perform on, and the band itself was never officially authorized. Bennie Nardone, a former 39th Infantry Regiment man related a story about the band in 1965. “I served under Colonel Flint and was the Regimental band leader. After the Sicilian battles, a Lieutenant piano player and myself played many impromptu concerts for the GI’s and Colonel Flint was always there. During the heat of an engagement with the Germans, Colonel Flint asked me to try and locate half a dozen of our boys and see if we could salvage half a dozen of beat up instruments in a trailer to the rear. We found some instruments that would make a noise. We then returned to the area where K Company was pinned down. The Germans were holding them to a standstill. We were greeted by enemy mortar fire upon our arrival. Without any “tuning up” we stood straight up and started blaring away! The war seemed to end. Both the Germans and Americans ceased fire and lay there enjoying such Jazz strains as ‘The Jersey Bounce’, ‘The St. Louis Blues’, etc. The next day, the town was captured by the Americans. I was then ordered to Colonel Flint’s headquarters and was thanked personally for our performance. Colonel Paddy Flint, a true fan of the Black Market Band. *The complete letter by Bennie Nardone was published in the Octofoil newspaper #18, 6 in the May/June 1969 Issue.